Introduction: Effective teaching is critical for student learning, especially in professional fields such as dentistry and dental hygiene and further, the effective behavior of educator must include organization, enthusiasm, empathy, rapport, clarity, general knowledge, and being available for students. Aim: The aim of this study is to assess teachers' perception regarding the final-year dental students' classroom behavior. Materials and Methods: Data for this qualitative study came from three focus group discussions (FGDs) with teachers teaching final-year BDS students. Participants (n = 15) represented the department of pedodontics, prosthodontics, and conservative and endodontic dentistry. FGD was conducted department wise with participation of five teachers each. A conceptual framework was prepared with seven questions for conducting FGD. Data from the FGD were analyzed by combining similar quotes into categories. Results: The data from the FGD led to the formation of seven categories with similar quotes in each category. Teachers reported about different behaviors of students depicting their lack of attention in lectures with the most common reason being: engaging in electronic gadgets, chatting with each other, yawning, and getting bored after 5 min of commencement of lecture. Teachers also mentioned the hectic schedule of students being one of the reasons for lack of attention. Suggestions of improving students' behavior were also reported which included different meditation techniques and change in classroom structure. Conclusion: The study reveals that teachers face a lot of inappropriate behavior from the students' side while delivering a lecture in the classroom. Different ways can be employed to increase the concentration of the students. Every dental college has its own academic schedule to fit in clinical working hours and lecture hours as per the Dental Council of India. Most often, the arrangement for the final-year BDS teaching followed is, one lecture in the morning, succeeded by clinical posting and one/two lectures in the afternoon. For years now, the 60-min classroom lecture pattern has not changed much, except that there has been a shift in the method of teaching, from chalk and board, to slide projectors, and presently to PowerPoint presentations. Effective teaching is critical for student learning, especially in professional fields such as dentistry and dental hygiene and further, the effective behavior of educator must include organization, enthusiasm, empathy, rapport, clarity, general knowledge, and being available for students. Talwar and Weilin in their study identified that women dental educators valued basic lecturing skills as most important, whereas men perceived organization and subject knowledge as critical. Teaching–learning process goes hand in glove. Given that there is an effective dental educator, it is very important that the learner complements the educator with effective learning behavior to absorb the transmitted information. The mind has a peculiar tendency of wandering. It is an unintentional and automatically occurring phenomenon which happens anywhere, and at any time of the day with no exception to dental students' mind during classroom lectures. Thus, maintaining students' attention in the classroom is a challenge for the teachers and an essential task as this is linked with the learning outcome of the students. A study in the literature depicts the inherent nature of wandering of mind among students. In this study, the teachers were asked about their perception regarding students' classroom behavior and it was reported that students lack attention in lectures, they sit idly and daydream. Teachers also mentioned about the use of electronic gadgets by students for texting, listening to music, surfing on the web, and playing mobile games to avoid their boredom in the lecture class. Stuart and Rutherford reported about an average attention span of students being of 15 min, but lecture time is for 60 min and hence students' attention needs to be of a longer duration to be able to acquire knowledge. Literature is replete with studies,,,,, discussing the uncivil behavior of the dental students in the classroom, however, there is no research reflecting the students' learning behavior. Hence, this qualitative study was undertaken among the teachers, to know their perception regarding the final-year dental students' classroom behavior related to the teaching–learning process. A qualitative study was undertaken at a Dental College in the month of December 2015 among teachers, teaching the final-year undergraduate dental students. Ethical approval was obtained from the institutional ethics committee (DPU/RandR (D)/99 (4)/16) before starting the study. According to the Dental Council of India, the final year of BDS is divided into two semesters with four subjects in each semester. This study was conducted among teachers teaching final-year second-semester batch. The subject teachers of the following four departments were chosen for this study: pedodontics, oral surgery, endodontics, and prosthodontics. Criterion sampling was used to include the teachers for focus group discussion (FGD). Five teachers per department, who had conducted at least one lecture for the final-year students in that specific academic year and were willing to participate in this study, were randomly chosen. For conducting an FGD among teachers, a conceptual framework was prepared [Table 1] which consisted of seven open-ended questions. The questions asked were regarding the kind of behavior noticed in the classroom, about students' lack of attention and concentration signs observed, attitude reflected in the classroom while the lecture is in progress and response towards introducing any technique to have overall improvement in the classroom behavior. Three FGD were carried out separately with five teachers in each group in the Department of Public Health Dentistry. FGD was conducted in the English language by the facilitator and assisted by a note taker. An audio recorder was placed in center of the group and informed consent of group members was obtained before starting the FGD. All the participants were assigned a number, along with the sitting arrangement done in a circle [Figure 1]. Initially, all the group members were asked to introduce themselves following which the facilitator opened questions one after the other for discussion in the group. Throughout the discussion, the participants were encouraged to put their views to the facilitator and other group members and probing was done whenever required. All the FGD lasted for approximately 20 min. Inductive method was adopted for analysis, wherein information obtained through audio recordings was transcribed verbatim. Data were analyzed by first reading the notes; this was followed by coding the data and then selecting similar codes and quotes to combine them into groups to generate different themes and subthemes. Three FGDs were carried out separately with five teachers in each group. Those teachers teaching the final-year BDS students from the department of pedodontics, prosthodontics, and conservative and endodontic dentistry participated in FGDs. Senior lecturers (n = 12) and readers (n = 3) participated in the FGDs. A total of three participants (readers) had an experience of 6 ± 0.3 years, while 12 respondents (senior lecturers) had 3 ± 1.2 years of experience. There were 11 male teachers and 4 female teachers. Data saturation was obtained after three FGDs, and hence no further FGDs were carried out (thus oral surgery teachers' FGD was not conducted). “Soon after 2 min I start with the lecture, I can see students losing their attention. And after few more minutes, they will open their mobile phones and will either start playing mobile games or would keep texting their friends.” Teachers face a lot of difficulty in maintaining their students' attention. They show some or the other behavior changes such as writing journals, yawning, and talking during the lecture which distracts the teacher. “I can see only first two benchers attentive or maybe they are forced to remain attentive as they are sitting on the first bench (laughs).” Teachers have reported that this gets reflected when they ask random questions during the lectures, wherein only two to three students would answer correctly. “Their attentiveness gets reflected when they are not able to answer the questions asked in viva.” Their poor attention gets noticed in the marks obtained during exams. Maximum, the students can be attentive for 20–30 min after the lecture commences. “Whenever they are asked questions in the middle of the lecture, they can never answer them except for few. Moreover, they will pretend as if they know the answers but are not able to recollect and will get lost in their thoughts.” Almost all teachers responded that students fail to answer the questions asked, showing their distraction in the lecture. “Few students are so not into the lecture that when asked about which topic is being taught since past 5 min they would fail to answer this too.” Teachers reported that the timetable about the topic to be taught is made available to the students well in advance through the college site. Since they are told in advance, they are expected to read and come to the lecture for better grasping of the topic. But hardly any student goes through the topics. Teachers reported adopting various ways so as to improve student's concentration in the lecture. “I prefer to ask them question randomly. May be I will call out random roll numbers to answer my questions… At least in the fear of getting asked they would pay some attention towards what is being taught in the classroom.” Asking random questions was adopted by few while few believed in making the lecture interesting by showing videos related to the topic taught. When asked about introducing a meditation technique just before the lecture in a hope that it will improve overall students behavior, mixed responses from the teachers were observed. “It's a nice idea. I have heard a lot on how meditation helps students in improving their concentration. This might definitely be of use.” While there were also few of them who responded “Meditation…… I am not sure… may be that will induce more sleep in the students.” “Let's see if it helps.” Many of the teachers felt that meditation would relieve the stress among students; it will make them feel fresh thus improving their overall classroom behavior. “May be we should allow them to bring a cup of coffee or juice into the lecture and then they can have sips of it while lecture continues just to remain fresh throughout the scheduled time.” Few teachers also mentioned about using more video-based learning and cracking jokes in between the lecture to lighten the classroom atmosphere. Being attentive during lectures is very important in the learning process for students. Adequate attention during lectures helps students to gain knowledge and implement it accordingly. The mind has a peculiar tendency of wandering not only when a person is unoccupied but also when he is engaged in a very demanding task. The FGD of teachers revealed that there are very few students being attentive in class, most of them lose their concentration within 5 min of commencing the lecture, the students are found chatting with each other, busy with mobile phones, daydreaming, yawning, tired, and completing journals. These findings were similar to the observations reported by Sun and Shek. This may be because the lectures are considered monotonous and it becomes difficult to pay attention throughout the lecture. Thus, students keep themselves engaged in some other activity during lectures to avoid boredom. The present study focused on the classroom behavior of the students related to the teaching–learning process. Rowland and Srisukho have evaluated the perception of teachers regarding the uncivil or inappropriate behavior of dental students in the classroom. The list of was as follows: cell phone use during class, challenging the authority in class, demanding special treatment, “I paid for this” attitude, making offensive remarks, prolonged chattering, walking in and out of class, talking out of turn, surfing the web, sleeping in the class, arriving late in class, not paying attention, reluctance to answer questions, cheating in class, reading newspaper or magazine, and leaving class early. Furthermore, the study reported that women teacher, young faculty with less experience, and teachers of different color faced more uncivil behavior from students in class. Further, an Indian study revealed that among all students, the mean perception of uncivil classroom behavior was significantly high among the undergraduates (68.17 ± 14.5) and 88.6% of the students agreed that they were involved in uncivil classroom behavior previously. Their study focused on uncivil behavior and more serious unethical practices by the students like forgery of the staff signature, not completing assignments, staff abuse, proxy attendance, not following dress code, and missing classes. 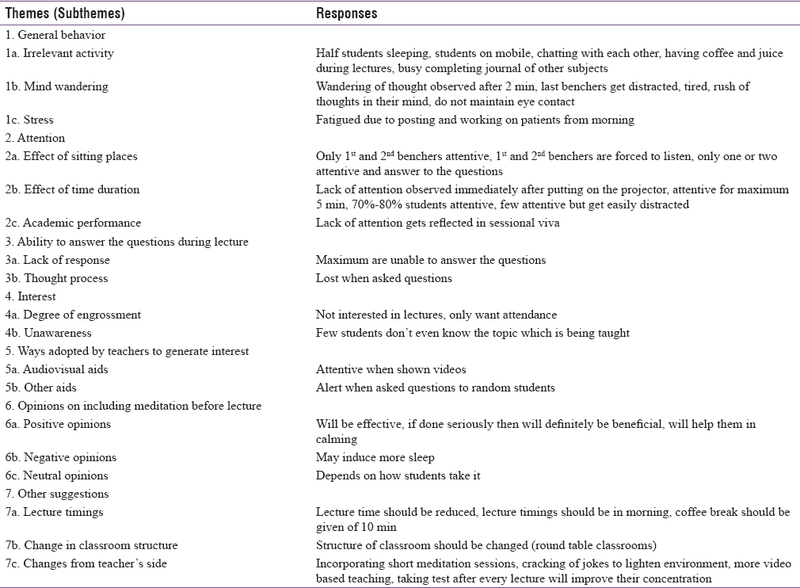 In the present study, the responses given in regard to the strategies adopted for maintaining students' attention in the classroom: Teachers said that they use question technique to keep students engaged and some expressed that audiovisual aids helped in holding students' attention during lectures. In the present study, teachers adopted a technique of showing more videos and teaching student through these videos. This technique adopted is similar with the study done in the past, wherein different methods were adopted to keep students engaged during lectures which included audiovisual aids as one of the technique. Asking random questions to students was also adopted by few teachers in the present study which is similar with the study and a review by Szpunar et al., which mentions the use of quizzes during lecture to reduce wandering of students' mind. Teachers in the present study also gave few recommendations of changing the classroom structure to round classrooms, giving frequent short breaks in between the lecture to sustain students' attention and reducing lecture time. A study done by Stuart and Rutherford also discussed about giving short breaks during lectures to medical students for sustaining their attention for a longer time and also suggested to limit the lecture time to 25–30 min over conventional 50–60 min. 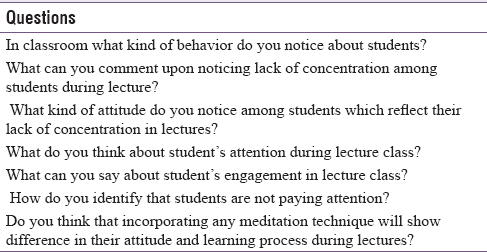 In the present study, teachers responded positively for incorporating meditation techniques before lecture to improve students overall classroom behavior. Different meditation techniques have also been introduced to students to check for their improvement in attention span. Few of them found in the literature are yoga, pranayama, light instrumental music, gibberish meditation, and mantra meditation. All these meditations have been found to be effective in improving students' concentration in lectures along with disciplined and active classroom behavior. In addition, Yoga can also help to increase students' ability to concentrate, focus, and improve memory. Some ground realities cannot be ignored. Although teachers take a lot of effort from their side to make the lecture interesting and students too, try hard to concentrate on the lectures but sometimes when it comes to teaching, there are few topics in each subject which are very theoretical and cannot be made interesting for the students as they are to be taught the way they are. In addition, the total lecture time is of 60 min from which 15 min goes off in assembling and taking attendance. Teachers too are obligated to finish their lecture in just 45 min due to which they may have to rush with the topics. Moreover, students too may have hectic schedule of lectures and clinical posting along with the stress of quota completion. The lectures scheduled in the afternoon after lunch tends to make students sleepy after having food, which is evident to the teachers in the lecture. All these things together have a propensity to divert students' attention more easily in the classroom. Hence, the classroom behaviors observed among students maybe a result of different circumstances. The students about whom the teachers have given their perception in the current study belong to Generation Z (iGen or Gen z) who have a “digital bond with the internet.” These students want their professors to help them engage with and apply the content rather than simply share the information. In addition, they are the multitaskers and switching between different tasks and paying simultaneous attention to a wide range of stimuli comes naturally to them. It is also the time that teachers need to make some changes in the way of taking lectures. The study reveals that teachers face a lot of inappropriate behavior from the students' side while delivering lecture in the classroom. Given the constraints, the timetable committee can take steps to schedule the lecture classes for the morning and the teachers can try to implement the various suggestions discussed in this paper to generate interest and to keep up the concentration of the students. Schönwetter DJ, Lavigne S, Mazurat R, Nazarko O. Students' perceptions of effective classroom and clinical teaching in dental and dental hygiene education. J Dent Educ 2006;70:624-35. Talwar DS, Weilin S. Qualities of an effective teacher: The dental faculty perspective. J Dent Educ 2005;69:116. Szpunar KK, Moulton ST, Schacter DL. Mind wandering and education: From the classroom to online learning. Front Psychol 2013;4:495. Sun RC, Shek DT. 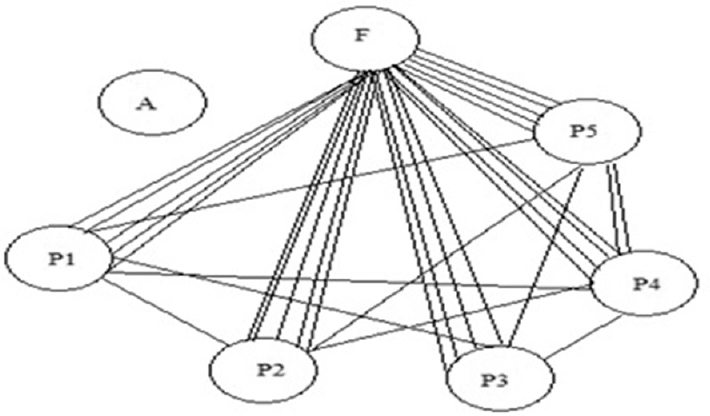 Student classroom misbehavior: An exploratory study based on teachers' perceptions. Scientific World J 2012;2012:208907. Stuart J, Rutherford RJ. Medical student concentration during lectures. Lancet 1978;2:514-6. Al-Dwairi ZN, Al-Waheidi EM. Cheating behaviors of dental students. J Dent Educ 2004;68:1192-5. Ballard RW, Hagan JL, Townsend JA, Ballard MB, Armbruster PC. Perceptions of uncivil student behavior in dental education. J Dent Educ 2009;79:38-46. Shetty A, Lagisetti AK, Bhat R, Hedge MN, Hedge P, Shetty C. Perception of uncivil behavior in classroom and clinical environment in a dental college. Int J Inform Res Rev 2016;3:2354-7. Rowland ML, Srisukho K. Dental students' and faculty members' perceptions of incivility in the classroom. J Dent Educ 2009;73:119-26. Satyanrayana D, Kulkarni S, Doshi D, Reddy MP, Reddy BS, Srilatha A. Perception of uncivil classroom behavior among the faculty members and the students in an Indian dental institution. J Indian Assoc Public Health Dent 2017;15:61-7. Mooneyham BW, Schooler JW. The costs and benefits of mind-wandering: A review. Can J Exp Psychol 2013;67:11-8. Shabiralyan G, Hasan KS, Hamad N, Iqbal N. Impact of visual aids in enhancing the learning process case research: District Dera Ghazi Khan. J Edu Pract 2015;6:226-33. How to Create Memorable Lectures. Speaking of teaching. Newsl Teach 2005;14:1-5. Available from: http://www.web.stanford.edu/dept/CTL/Newsletter/memorable_lectures.pdf. [Last accessed on 2016 Oct 04]. Kauts A, Sharma N. Effect of yoga on academic performance in relation to stress. Int J Yoga 2009;2:39-43. Fortney L, Taylor M. Meditation in medical practice: A review of the evidence and practice. Prim Care 2010;37:81-90. Namwamba JB. Effect of background classical instrumental music on performance in algebra test and algebra self-efficacy of college students. Southwest Educ Res Assoc 2012;1-11. Saxena R, Shirahatti RV, Shah C, Kazi M, Bhosale A, Ladkat, et al. Impact of gibberish meditation on student's learning in a dental school. Int J Med Sci Public Health 2013;2:446-52. Gursale SC, Ghanta M. Effect of modulation of environment of learning by ‘Mantra-Meditation’ in MBBS students. Int J Recent Trends Sci Technol 2015;16:70-3. Galantino ML, Galbavy R, Quinn L. Therapeutic effects of yoga for children: A systematic review of the literature. Pediatr Phys Ther 2008;20:66-80.